Q. When do events run? A: The dates available vary depending on your chosen venue. However all venues offer a selection of weekday and weekend events. We recommend booking your experience as soon as possible to avoid disappointment. Q: How long will my voucher be valid for? A: Vouchers are typically valid for 12months from the date of purchase, unless otherwise stated. 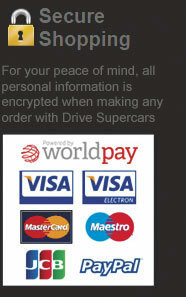 Your driving experience must be booked and taken prior to this voucher expiry. Q: What will I get in my voucher pack? A: Your voucher will be sent to you by first class post, in an unmarked envelope. This will contain your experience voucher, which can be personalized with a message on checkout, this voucher contains essential information needed to book your experience. You will also receive a gift letter explaining the details of the experience and a booklet that gives you full details on how to book your experience. A: In your voucher pack you will be provided details on the venue for where your voucher is valid, for choice vouchers you will be given a list of all the venues where you can redeem your experience. In order to book simply call your chosen venue, quote your voucher number, expiry date and product name and the venue will discuss the available options. Please note you do need to of booked and taken your experience prior to the expiry date on the voucher. Once your experience is booked the venue will send you full details of your booked date and venue information. Q: Are there any added extras? A: Once you have purchased your voucher you will often be offered optional extra's from your chosen venue, these can include additional drives, car or lap upgrades and a collision damage insurance waiver which is a standard throughout the industry. For any queries please feel free to contact our offices.